Experience Civil War history, the finals of the A Cappella & Unplugged music competition, a Victorian-era ball and traditional street fair during the 1864 Weekend from July 20-21 in Franklin County! The Burning of Chambersburg recreates when Confederate soldiers burned the town during the Civil War in 1864. 1864 always celebrated the rebirth of the town and the spirit of the people, who brought Chambersburg to life. 1864 Weekend began as a kick-off event for Civil War 150 in 2011. Partnering with nearby Gettysburg PA, Franklin County highlighted its significant Civil War history. Over the past seven years, the event continues to grow as a celebration of the spirit of people and community. In 2015, the event added a musical competition called A Cappella & Unplugged with auditions and three rounds of competition. A Cappella & Unplugged is back for this year’s events, too. The finalists of this competition will perform beginning at 7 PM on Saturday, July 21, on the steps of the 1865 Franklin County Courthouse. The public picks the winner through a combination of Facebook likes and votes cast at the event, and the winner receives $500. 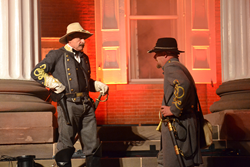 The Courthouse steps are also the stage for the 1864 burning event, creating a truly authentic backdrop, for the re-enactment done totally with lights and atmospheric effects. On July 30, 1864, Confederates demanded a ransom of $100,000 in gold or $500,000 in Yankee dollars or Chambersburg would be burned. The town was unable and unwilling to deliver the money, and the center of Chambersburg was fired. More than 2000 people were homeless and over 550 structures burned. Yet, the town returned, stronger than ever, and this is the basis of the annual celebration. It is a tribute to the strength of people and community. Pollard connected the wisdom of Benjamin Franklin, for whom the county is named, to the history of July 30, 1864 by noting this Franklin maxim, “While we may not be able to control all that happens to us, we can control what happens inside us.” The citizens of Chambersburg could not control the ransom demand or the destruction of so much of their town, but they could control what happened afterward. Today, Chambersburg stands as a proof of their strength and effort." History and culture comes alive beginning on July 20 with the 1864 Civil War Ball at the Allison-Antrim Museum in Greencastle. From 7PM to 9:30PM, learn Victorian-era dances guided by the Victorian Dance Ensemble in the historic bank barn. Tickets are $15 a person and $25 a couple. Tickets are available on Eventbrite at https://www.eventbrite.com/e/1864-civil-war-ball-july-20-2018-tickets-46978545093. 1864 Burning & Rebirth Light Show- July 21 9PM- The re-enactment and light show done completely with atmospheric effects and actors! Join the thousands that gather to watch as the town is transported back to 1864 and ransomed by Confederate soldiers! The Franklin County Visitors Bureau invites all to explore Franklin County PA and enjoy the trails of history, arts, and architecture, recreation, natural beauty, fresh foods and the warm hospitality of communities like Chambersburg, Greencastle, Mercersburg, Shippensburg, and Waynesboro. Franklin County PA is located just north of the Mason Dixon Line and is an easy drive to Washington DC, Philadelphia, and Pittsburgh. Discover more…plan a visit soon at ExploreFranklinCountyPA.com or by contacting 866.646.8060.